The end of the war meant more sporting opportunities in Britain. 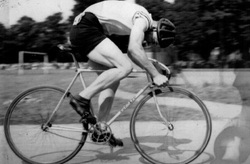 Tommy was training hard during this time, which helped him qualify first for international selection and eventually the 1948 Olympic Games in London. Tommy’s career highlight came at these Games when, at the age of 27, he won two Olympic bronze cycling medals; the Men’s 1,000m time trial and Team Pursuit. He also went on to win a bronze medal at the 1950 British Empire Games held in Auckland, New Zealand (now called the Commonwealth Games). As Britain's first paid national cycling coach he helped train a new generation of British track riders, many of whom went onto win national and international titles and medals. In retirement Tommy was as enthusiastic and motivating as ever, relishing every opportunity to inspire others and share his passion for sport. He was very proud of his role as a Loughborough Flames ambassador, motto “Honour the past but look to the future”. This project went on to win the Podium Coubertin Olympic Vision award. He enjoyed speaking to children and young people about his experiences in the build up to London 2012 for which he was an official ambassador. He was presented with an honorary doctorate in Sports Science from Loughborough University a proud achievement for someone who had little formal education beyond the age of 12. You can find out more about our Tommy Godwin here and in his autobiography It wasn't that easy (2007). Copies of this are available with all the proceeds going to charity. Please use the contact form if you would like one. Watch Red Kite Cycles' latest short video, made in 2016. Adrian talks to Brian Wevill, a local cyclist who worked for Tommy Godwin in his cycle shop in the early seventies. They talk about his immaculate Godwin race bike, his memories of Tommy and his shop, and his plan to ride the bike in the 2016 Tommy Godwin Challenge Sportive.